Achala Abeysinghe reports back from COP23 and asks whether the outcomes of this year's UN climate summit will be enough to keep the Paris Agreement on course. At 7am on Saturday – more than 12 hours later than COP23 was due to conclude – delegates applauded Fiji for its inspiring presidency at this year's UN climate talks. The tiny Pacific Island led with big ambition, sealing Parties' agreement to the main outcome of COP23 – the Fiji Momentum for Implementation (PDF). But will this outcome text be enough to keep the Paris Agreement on course? December 2018 is the deadline for finalising the Paris "rulebook" – the rules and processes for turning the ambition of Paris into action. 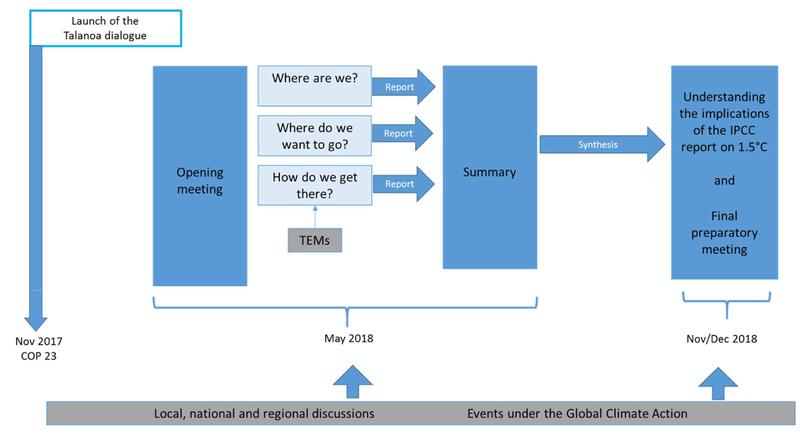 The two weeks of negotiations saw significant steps in driving forward the framework for transparent reporting and reviewing climate action under the agreement. However, other areas made little headway, including the guidelines for nationally determined mitigation and adaptation plans, the global stocktake for assessing progress in reaching the agreement's long-term goals, and on the mechanism to facilitate implementation and promote compliance. Parties set forth their firm determination to meet the 2018 deadline (PDF), but lack of balanced progress on all areas of the Paris rulebook risks throwing this target off course. How far this work advances will have a major impact on national level implementation too. The Fijian and Moroccan COP presidencies presented the Talanoa dialogue (PDF) design (formally known as the facilitative dialogue 2018). The dialogue seeks to drive ambition for ramping up action for reducing greenhouse gas emissions. Countries' buy-in into the design of the dialogue this year was crucial: they will now be ready to engage with the dialogue when it starts in January rather than getting caught up in procedural discussions. The Least Developed Countries (LDCs) are pinning hopes on the Talanoa dialogue to drive the urgent and ambitious climate action needed to limit the global temperature increase to 1.5 degrees Celsius through strengthening Nationally Determined Contributions (NDCs). Bending the curve of emissions by 2020 will pave the way for a just transition to net zero emissions by 2050 and a climate resilient world; it will also keep the Sustainable Development Goals within our reach. COP23 stood out for recognising the urgency of pre-2020 climate action implementation and ambition. Parties agreed that enhanced pre-2020 ambition are the solid foundations for enhanced post-2020 ambition and agreed on a number of important steps (PDF), including taking regular stock of action on the ground in 2018 and 2019. The lead-up to COP23 saw extreme climate disasters across the world continue to cause immeasurable suffering. The poorest, most vulnerable countries are left struggling to cope with loss and damage caused by climate change. However, the urgent need for action did not translate into a clear decision at COP23. Instead, countries agreed to hold the Suva Expert Dialogue (PDF) next year with hopes that this dialogue will lay strong foundations for delivering urgent and ambitious action to support those countries hit by the devastating and irreversible costs of climate change. Climate finance will continue to underpin success of the Paris Agreement. Germany's contribution of 50 million euros to the Adaptation Fund and 50 million euros to the Least Developed Countries Fund (LDCF) was welcome news, with Sweden and Belgium also contributing to the LDCF. Countries also made an important decision that the Adaptation Fund "shall" (previously "should") serve the Paris Agreement (PDF). In other words, the Adaptation Fund is now formally recognised as one of the financing tools for achieving the goals of the Paris Agreement. Next year, countries will need to agree how the fund will remain an effective source of crucial adaptation funding for developing countries. Despite this good news, developing countries remain deeply concerned that climate finance, rather than being significantly scaled up, will taper off. Adequate, sustainable and predictable climate finance is essential for developing countries to implement – and increasing ambition of – their climate action plans. The adoption of the Gender Action Plan (PDF) and the Indigenous and Local Communities' Platform (PDF) was a major step forward in amplifying marginalised voices and recognising the disproportionate impact of climate change on women and indigenous communities. However, words without actions stay empty promises: the question now is how these initiatives will really bring the voices of these marginalised groups into the heart of the international climate policy process. After years of fraught negotiations on this issue, the COP23 decision on agriculture (PDF) requests the subsidiary bodies of the UNFCCC to simultaneously address vulnerabilities of agriculture to climate change and approaches to tackle food security. Breaking the deadlock on issues connecting agriculture and climate change was a big win for COP23. LDCs continued to play a proactive role in pushing for ambitious decisions at COP23, and led the way with NDCs that commit to mitigation and adaptation action far beyond their fair share while proposing their own initiatives such as the Renewable Energy and Energy Efficiency Initiative (REEEI). But the drive and ambition of the LDCs needs to be matched by support from the international community. 2018 will be a crucial year for climate action: Parties must complete work on the Paris Agreement rulebook and deliver a Talanoa dialogue that culminates in more ambition by all. Global solidarity and support from the international community to complete this work and ensure more ambitious actions on the ground will be critical for keeping the promise of Paris on track. Achala C Abeysinghe (achala.abeysinghe@iied.org) is an expert on legal issues in international climate change negotiations. She is currently legal and technical adviser to the chair of the Least Developed Countries Group for the UNFCCC.